Here is a fabulous award winning kitchen from Dawn Gogle at Hoppet Design…. Photographed at dusk with a 4×5 camera and a few lights to fill in for the gaps in ambient light. This entry was posted on November 22, 2008 at 2:52 PM	and is filed under Advertising Photography, Architectural Photography, Public Relations Photography. Tagged: Architectural Photography, Public Relations Photography, seattle architectural photographer. You can follow any responses to this entry through the RSS 2.0 feed. You can leave a response, or trackback from your own site. Great balance of interior and exterior lighting. 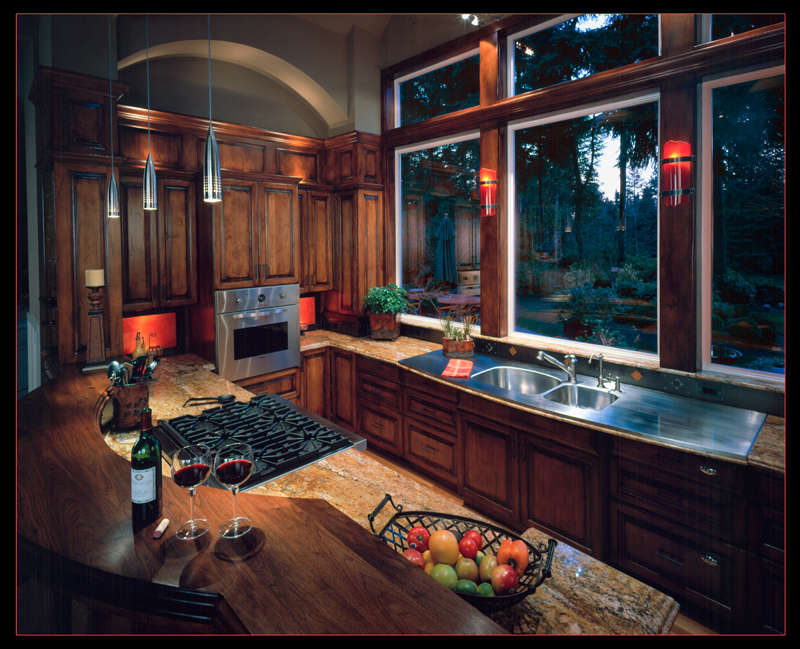 Love the warm light in the kitchen contrasted with the cool NW light outdoors. The computer has taken the edge off the really really blue exterior from Tungsten film. I should have gelled the windows but lacking the hollywood budget and not having anymore than 20 minutes to set this up and shoot I was in panic mode to get this shot.